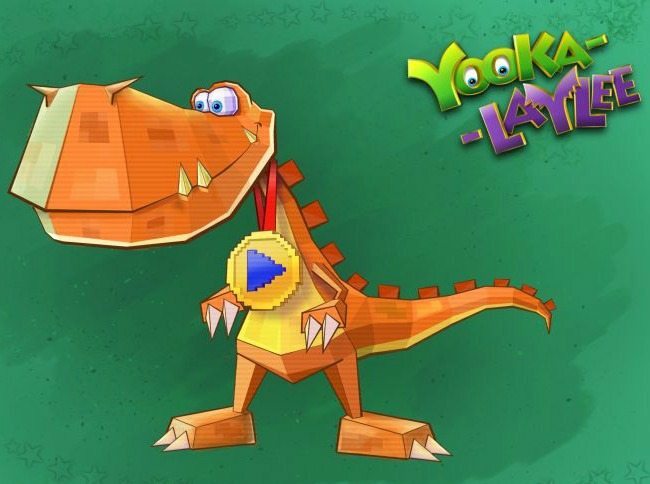 Playtonic Games has revealed Rextro Sixtyfourus, a blocky, old-school dinosaur character that will appear in Yooka-Laylee. Rextro has been created by technical art director Mark Stevenson, who continues to drawn on his experience working on the Donkey Kong Country series, Kameo and, in particular, Donkey Kong 64. “We decided on using a dinosaur pretty early on as this is a creature that naturally associates with a past era,” Stevenson share with IGN. “Then I think mostly my inspiration came from work I’d done previously on characters for the Donkey Kong 64 game. Rextro is the guardian of the arcade machines that will be hidden in each of Yooka-Laylee’s worlds, with at least one in each world that will test players with a retro challenge – the reward of which will be a Pagie.